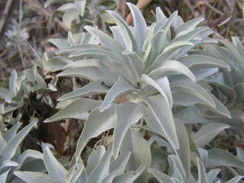 White sage is commonly used in smudge sticks. I’d been collecting it for years for this purpose before realizing I could cook with it too! Seriously cool discovery. 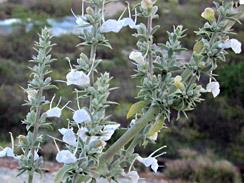 White sage, also called Bee Sage or Sacred Sage, has whitish or silvery-grey evergreen leaves with aromatic oils and resins. Mature plants send out tall shoots reaching five or six feet tall. Its flowers are sometimes a pinkish hue. Smaller plants can look quite different than the those with tall shoots. The most reliable way to identify this plant is learn its scent, and look for its leaf clusters which loosely form an arcing ball shape several inches across, resembling the shape of a pineapple top. Please (!!!) be respectful when working with this plant. Native peoples consider it sacred, and contemporary uses emulating native practices have encouraged over harvesting for commercial gain. Remove only a portion of each plant, allowing it to grow and thrive. 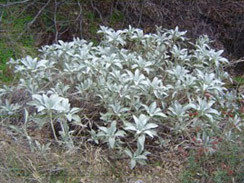 Use the leaves as a spice, much as you would garden sage. Perfect for flavoring soups, dicing and adding to sautéed dishes, pastas, or flavorizing flesh. Leaves can also be used for tea. Tribal culinary uses include eating stems and leaves, making gruel and flour from seeds, and using the seeds to create a refreshing drink. Seeds can also be grinded and used as a spice. Sages also have medicinal properties.